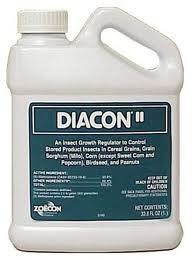 Diacon II � an insect growth regulator (IGR) containing methoprene, for prevention of stored product pest larvae from becoming adults. Effective, long-term control of stored product pests. * For protection of grain, animal feed, seeds, cereal grain, corn popcorn, spices peanuts and other food commodities. * For treatment of grain being stored, as a top dressing, inside headspace and other storage areas. * To be applied as a fog or surface spray in food processing establishments, warehouses, silos, grain elevators and other storage area. * Mix with water or oil-based formulations.